Mount Hope, 18 March 2004. Photo by Euphro. Creative Commons licence. Another ongoing campaign asks users to identify flooded and damaged infrastructure and trash heaps in post-Hurricane Maria Puerto Rico. “A world map tells a lot about the person who has made it, or about the market it is made for,” says Frans Blok. The edges of equatorial projections are determined so as to put the map’s audience at the centre of the map: European maps put the Bering Strait at the edges, Australian and Asian maps the Atlantic, American maps break Asia in two. If, however, only the polar regions were habitable—or if you were making a map for penguins—you might use a polar projection centred on Antarctica. 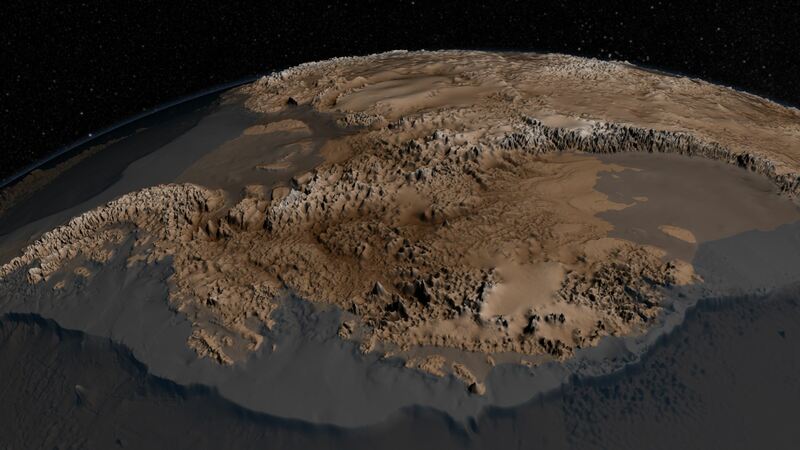 NASA has released an updated map of the bedrock beneath the Antarctic ice sheet; the map, called Bedmap2, adds considerable detail—a tighter grid and millions of data points—to its decade-old predecessor. The image above exaggerates vertical scale by a factor of 17 to increase visibility. See also this short video.